The winter holidays are upon us, & the clock is ticking. Let Lady Enchantee take some of the stress & guesswork out of your gift giving plan. We have the perfect gift sets for the magickal folk on your list. 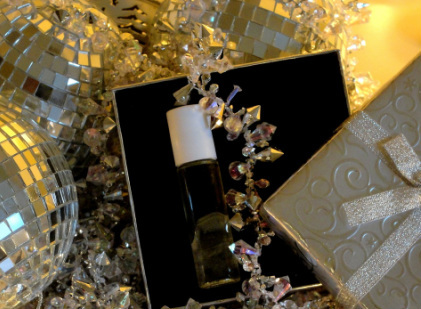 Check out our value priced ($20) Stocking Stuffer Dressing Oil Set, gift wrapped & ready for presentation, in a pretty silver box as shown to the left, complete with a holiday gift card. Or, spring for Lady Enchantee's one-of-a-kind Frankincense & Myrrh Perfume Duo ($50), also gift wrapped for your convenience. Of course, we also have a rare holiday treat, Lady Enchantee's own Blessed Be Nag Champa Perfume ($30). Your favorite witch will be charmed by our Witch's Classic Annointing Oil Collection ($30), a gorgeous set of the 6 most revered annointing oils used by witches down through the ages. We also have a lovely selection of individual magickal sundries, all under $16, for your gift giving pleasure. Take a peek at our pretty pagan merchandise for the home, too. Everything's under $30. Our magickal bookshelf is stocked, & nothing is over $18 there, so give that a peek, too. Let's shorten that shopping list together, smoothly sidestepping the mayhem that Mercury retrograde is bound to bring November 6th-26th, 2012, so that you & yours can have a truly happy holiday season. Happy Holidays from all of us here at Lady Enchantee to all of you. We can enhance our modern magickal life with little treats & touches that celebrate the pagan path in an uplifting way. Here you'll find quality, original gifts & magickal sundries for yourself or a wonderful witch in your life. Lady Enchantee has lovingly created these items with an emphasis on quality construction & celebration of magickal living. Enjoy browsing our selections & see what we have that would serve you on your peaceful path. All purchases may be made safely & securely through PayPal. Note: For closer inspection of the product images provided, simply click to enlarge. Green Glamour is an all natural, sustainable, ethically sourced & manufactured line of skin & hair care products made in the United States by Cocoa's Cottage. I am proud to be a a R&D consultant for Green Glamour. I have been using these products for years & years now, & I can attest to their efficacy & quality. I invite you to visit the ever growing line of Green Glamour products available at Cocoa's Cottage. You may just find something magickal there to make your life more beautiful! If you are looking for gorgeous, completely natural mineral makeup in an elegant palette that goes from day to evening effortlessly, you've found it! This collection celebrates the joys of nature with colors that can be used to either subtle or dramatic effect. To browse or acquire this exclusive collection, click here. For more information, view the video below. MineralFace FX is the only cosmetics company that we endorse. Here at Lady Enchantee, we proudly wear MFFX, just as we do Green Glamour skin care. Enhance your natural beauty with naturally beautiful cosmetics that are good to Mother Earth & good to your skin. An important part of my work is acquiring the highest quality items for my sister Kitchen Witches. Often, these are limited quantities of very special magickal tools & products that I have tested & found suitable to offer here. These items are all offered here on a "first come, first served" basis, so if you see something here that speaks to you, by all means order it, to ensure that you have your goodies before they're all gone. All payments arrangements are through PayPal & all prices are listed in US dollars. Thank you, & have fun browsing! 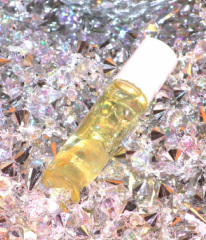 I am so proud & excited to be able to offer you this wonderful perfume oil! Would you like to hear the truly magickal story behind it all? This particular Nag Champa is pure & rare in every way - how it is sourced, how it is made, & when it is available. It is also potent! (You can smell the absolute across a large department store...I have the proof...but that's another story.) I have blended this gorgeous, costly Nag Champa perfume very carefully with a rich, pure, plant-derived vitamin E oil, & to each vial I have added a beautiful, ethically sourced quartz crystal from my gemologist friend who lives in Northern China. This perfume expands consciousness, enhances awareness, activates the Third Eye, & brings a feeling of peaceful abundance & well being to the one fortunate enough to wear it. I assure you that I have used the highest quality, purest ingredients to create this special perfume oil. Blessed Be is a celebration of life, & wearing it is one of the nicest pleasures on Earth. Shipping & handling are, of course, included in this price, when shipping within the 48 contiguous United States. Shipping to Alaska & Hawaii will be calculated separately. We do not ship this product outside of the United States. May you be fortunate enough to acquire Blessed Be. It is exceptional. If you crave the finest, purest nag champa for all of your magickal workings & to wear as an everyday protective blessing fragrance, you want this nag champa oil. It is strong, long-lasting, kind to skin, & beautifully balanced. It is ethically sourced, start to finish, & blended carefully to give you that "nag champa" experience of enlightened lightness & peace. It's packaged in a lovely little green glass bottle with a secure threaded top, just like our Witch's Classic Annointing Oil Collection, for best preserving power, but with a slightly different label design. This long-lasting 1/3 oz. bottle of gorgeous goodness is Lady Enchantee's personal favorite, & we are so pleased to offer it here, so that it can become your favorite, too. Price $6.00 US Shipping & handling are included in this purchase price. We ship only within the 48 contiguous United States. This is the end-all-be-all set of classic annointing oils for the serious, practicing witch. You can see them in the video above. These oils are suitable for witches of every tradition. I have not yet found a witch who does not enjoy using these six classic oils in magickal workings: amber, dragon's blood, frankincense, myrrh, nag champa, & sandalwood. These oils are made according to the ancient recipe taught to me by the high priestess & high priest who trained & ordained me as a high priestess. Each oil contains precious, pure essential oils & world class perfumer's oils blended in a pure, 1st pressing virgin olive oil for kindness to even the most sensitive skin. Once I discovered that not everyone can tolerate essential oils, I set out to find the very best perfume oils made ethically & sustainably...& find them I did. You can now enjoy the benefits of my journey with this elegant, rich set of annointing oils. To match our special oil set, we've sourced & prepared a gorgeous 18-stick incense set in amber, dragon's blood, frankincense, myrrh, nag champa, & sandalwood. You receive 3 of each traditional magickal scent in this set, allowing you plenty for your spells & rituals & for simply enjoying in your environs. Our incense sticks are of the absolute highest quality, hand-dipped, long-lasting, & very fragrant. This set is a wonderful addition to our Witch's Classic Annointing Oil Set, or you can use these by themselves to work your magick. By the way, these, like all of our products, are made by magickal folk for magickal folk. It's part of our commitment to The Path & to you. Price: $8.00 U.S. Shipping & handling are, of course, included in this price, when shipping within the 48 contiguous United States. Currently, we do not ship this product outside of the continental United States. To cleanse, clear, purify, & consecrate, nothing beats the witch's dynamic duo, frankincense & myrrh. This set, offered in glass 0.5 fl. oz. 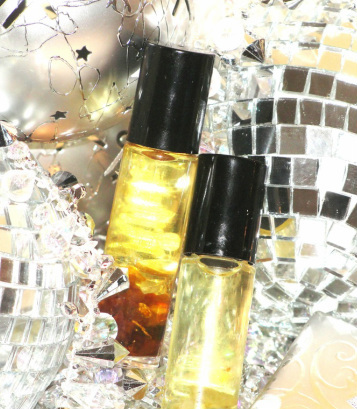 roll-on vials is the finest magickal, intentional perfume available. My frankincense & myrrh perfume duo is made with the highest quality, ethically & sustainably sourced essential oils, resins, & world class perfumer's grade fragrance, all in a rich, plant-derived vitamin E base, to ensure that your skin is blessed & nourished by these elegant, costly perfumes. If you are looking for a truly unique, exquisite gift with which to spoil your favorite witch, you've just found it. This set comes elegantly gift wrapped for your convenience. There is only ONE of these sets left, so if it's for you, pick it up now, using the safe, secure PayPal button below. For more information on this set, do review the last 4 minutes especially of the video above. Shipping by standard USPS parcel post & handling are included in the purchase price of this item when shipped within the 48 contiguous United States. Currently, we do not ship this product outside of the continental US. This is the delightful set of dressing oils featured in the video above! You will love the quality, the versatility, & the price point of this lovely 5 oil set, packaged in tidy, high quality roll-on 13 ml vials. This set provides a full spectrum of options for the witch on a budget, as well as for the witch new to her/his practice. North Oil is a rich, festive blend of apple, cinnamon, pine, & galangal. East Oil is a rich, pure vanilla certain to invite happy thoughts. South Oil is a juicy, energizing black cherry & lavender blend. West Oil is a gentle blend of ozone, sweet orange, rosemary, lavender, & my proprietary "sea garden" blend. Life Force Oil is a bracing blend of ozone, rosemary, & my proprietary "sacred cleansing" blend. All are in a beautiful, stable base of plant-derived vitamin E oil, with a light, safe preservative, non-toxic colorant agents, & gorgeous large crystal Mediterranean sea salt. Shipping by USPS parcel post & handling are included when shipped within the contiguous 48 United States. We do not ship this product offering outside of the continental US at this time. Expedited shipping is not available. Thank you for understanding. Black salt is a time honored staple for working witches of all traditions who have historically relied on this wonderful tool to enhance spells & rituals for setting clear, inviolable boundaries, for binding away deleterious energies, & for banishing excess negativity. Lady Enchantee herself makes our black salt from ethically, sustainably sourced Mediterranean Sea salt, hand harvested fallen sacred tree branches, sustainably harvested protective herbs from her magickal garden, & 80% post-consumer recycled paper. Each batch is infused with organic, sustainably manufactured essential oils perfectly matched to the Full Moon on which it is made. The current lot available is from the powerful Ascension Full Moon of September 29th, 2012, & so it is especially able to enhance intention to release & bind away all that no longer serves you on your magickal path. The name "Van Van Oil" came from North American regional pronunciations & mispronunciations of the French name for vervain, which is veh*VUHn, phonetically. Van Van Supreme Dressing Oil is my personal take on the classic Van Van Oil that has made New Orleans' reputation as a magickal capital. You cannot mistake the fresh, light scent of Van Van Oil. You will love our Van Van Supreme. It's bolstered with the highest quality hand-selected, organically grown herbs & roots. The essential oils used are of the highest quality available. We use only the necessary amount of emulsifying solution to bind our Van Van Supreme for a good length shelf life & easy use. Best of all, this stuff really works...& fast! We've tested for cleansing, peace, happiness, health, wealth, good luck return, fast luck, & fast money luck, & it's performed beautifully in all circumstances, showing results easily within 24 hours. Price: $9.00 US 0.5 fl. oz. roll-on vial. Oh, we've got your money, honey! We're being playful, of course, but this incense is powerful, limited in supply, & hand-made by magickal folk who deal specifically in money & abundance magick. It's the real deal. We were able to acquire some of this for everyone at our shop, & for you, our magickal friends, just in time for the Winter Holiday Season. "Like attracts like", as you well know. Burn this very special incense to set up the vibration of "money, money, money" & wealth in all ways. It smells just like cash currency & has some surprisingly happy results, especially when used with Lady Enchantee's Van Van Supreme Oil in rituals, spells, & intentional energy direction specifically for abundance & prosperity. You get 6 sticks of this hand-crafted, beautifully fragrant, long-burning incense. We fired up a stick right out of the shipment & it burned for over a half hour out-of-doors, in a stiff breeze. Needless to say, we were most impressed. Shipping & handling are included in the price of this product. We currently ship this product only to the 48 contiguous United States. Long-lasting, convenient, elegant, & discreet, this set of annointing balms will cover all of your basic magickal needs wherever you are in the world. A little goes a long way, when using these annointing balms. The balm medium eliminates the muss & fuss that may arise when using liquid annointing media. I designed these originally for myself to carry with me when traveling. I found them so effective & handy, that I whipped up a small batch to share with you. Shipping & handling are included in the purchase price when shipped within the contiguous 48 United States. Shipping & handling to Alaska, Hawaii, & Puerto Rico will be calculated separately for shipment by USPS. Shipping & handling to other global destinations will be calculated separately for shipment by DHL. Hecate, the Goddess of the Moon, rules the night, women's work & wishes, all crossroads, portals, entrances, & exits. In short, she embodies the consciousness & the wisdom that we need as we learn more about ourselves in times of great change, transition, & stress. These are the times when we can turn transition into transformation, sorting through our subconscious, looking deeply into the soul's mirror, & moving forward with only the best that we have to offer, gently & joyfully releasing all that no longer serves us. This annointing balm is designed to cover all circumstances calling for the elements & energies of water, earth, moon, dream wisdom, emotional intuition, reflection, as well as for protection, healing, blessing, & care of animals (especially dogs), women, plants, & children. Hecate Annointing Balm has proved helpful to those who divine through scrying & tarot card reading, as well, among our magickally inclined testers. Helios, the Sun, rules the day, all activity in business & politics, healing of bones & muscles, men's work & wishes, athletes & athletic endeavors, time, decisions, & general commerce & communications (spoken & written). Using the formidable, ebullient, abundant energies of the Helios consciousness, we can lay aside anxieties & cares, going forward with our decisions & meeting our goals in a spirit of great confidence, knowing that what we accomplish & acquire blessed not only us, but also everyone around us. This annointing balm is designed to cover all circumstances calling for the elements & energies of fire, air, sun, physical wisdom, "gut" intuition, physical protection while exerting oneself in work or athletic recreation, prosperity & protection of reputation & wealth in business affairs & legal matters, clear physical communication on any level, political integrity & success, goals met, abundance, prosperity, joy, enthusiasm, dynamism, & general cheerfulness. Helios Annointing Balm has proved helpful to some of our magickal testers in bringing better employment & general business success regarding better work environs, more pay, & greater wealth-building ability. Made of 100% cotton, this sturdy canvas classic can take you from the beach to the farmers' market to coven gatherings effortlessly. Featuring a handsome pentacle on both sides, full side & bottom gussets, 22" reinforce canvas handles, 10-ounce pure cotton canvas fabric, & measuring 15" x 18" x 6", this tote meets Lady Enchantee's exacting standards of quality construction. It's also machine washable on the delicate cycle; Lady Enchantee recommends air drying or machine drying on the lowest delicate setting. A magickal morning leads to a glorious day! Savor your morning brew in this elegant pentagram mug designed especially for you by Lady Enchantee. Every Kitchen Witch deserves kisses! Remind your near & dear ones to give you some love for the loving, healing, vibrant energies that you stir, knead, & blend into every delicious meal. Pagan pride goes to the gym, to the dance studio, to yoga, to tai ch'i...& beyond, in a sturdy, crisp white athletic tote that wears like iron & cleans up beautifully. Take this one to the beach, out weekending, or for an overnight Sabbat celebration with your coven. This is the kitchen witch's official Bathing Book of Shadows, hands down. I am so wild about this book that I have prevailed upon the publisher to allow me to offer it here in convenient e-book format to all of you, my magickal sisters & brothers in the Craft. It is literally packed with ancient, obscure knowledge; every currently known use for the sustainable, easily procured ingredients featured in each magickal, healing bath; & extra special, gorgeous, simple healing recipes, tips, & how-to hints on making unique magickal gifts. You may order your e-book here for only $10 US. Magick brings prosperity, whether times appear lean or we're enjoying the high-flying days of apparent abundance. Living large has much less to do with the size of our financial holdings & quite a bit more to do with our creativity & everyday savvy. As a Kitchen Witch, I have found this book to be of immeasurable value. Using the viable, easy, healthy, Earth-friendly tips & tricks in this book, I have been able to increase my prosperity through simple, creative, new daily choices that literally add up. This book has lots of wonderful culinary, health, & beauty recipes that nearly make it a modern Kitchen Witch's grimoire! It's our duty as magickal ladies to prosper wisely & with integrity. This book can help us do just that. The publisher has kindly permitted us to offer this publication in e-book format, so that all of my Kitchen Witch sisters have the opportunity to access it at the low price negotiated by the author herself...just $5 US per copy. If you'd like to have it in paperback format, you may order it through the publisher here. Click here to learn more & to order your spell today. Click here to arrange your tarot consultation with Lady Enchantee. If you would like to gift someone near & dear...or gift yourself...with a blessing, a memorial, or a wedding service, Lady Enchantee & her ministerial staff are ready to help. We provide all of these services: baby blessing, companion animal blessing, house blessing, memorial services for beloved animals & people, as well as wedding ceremonies, recommitment ceremonies, vow renewals, & special ceremonies to mark major anniversaries. Our rates are competitive, our ministerial staff is professional & compassionate, & our intention is to serve you with integrity & love, making your event memorable, special, & wonderful. Our entire staff are ordained members of the ULC clergy in good standing. You may secure our services with confidence. Excellence is our byword! If you would like more information, please visit our Ministry page & feel free to contact us, using our safe & secure Contact page.